I like walking when I am in a new place. When I am in a human habitat I map postboxes or do some OSM. If I trekking then I try to take pictures of flora and fauna so I can add to Biodiversity map on iNaturalist.org along with capturing the trail for sharing. iNaturalist.org is a place where you can record what you see in nature, meet other nature lovers, and learn about the natural world. The easiest way is to download their Android or iPhone app. But I generally enable GPS tagging1 in my phone camera app and then take pictures with it while I am walking. Once I reach home, I upload them to iNaturalist. The picture’s EXIF has all the information required to add an observation to iNaturalist. For example I took the above picture at Nrityagram near Bangalore. I took multiple pictures of the same to be sure. Once I reached home, I added the same as an observation. As you can see the location, date info is pulled from the image itself. You can do this for any species found anywhere in the world. 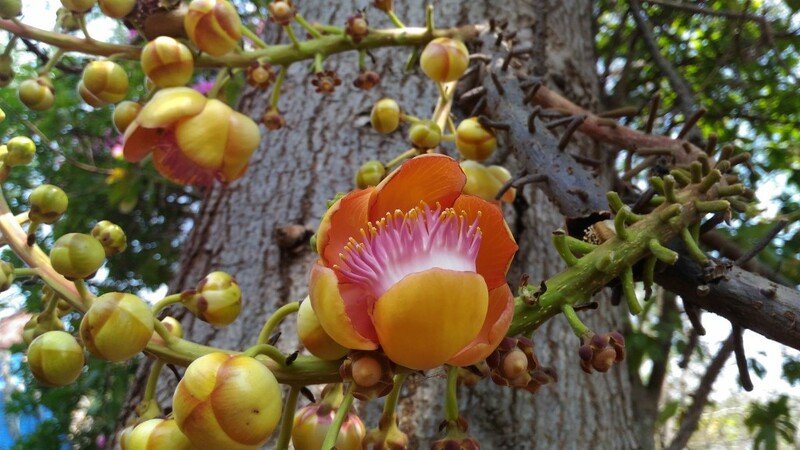 But this blog post was mostly to talk about smaller Bangalore Biodiversity Project. It’s a page on iNaturalist where I aggregate the species found in Bangalore. 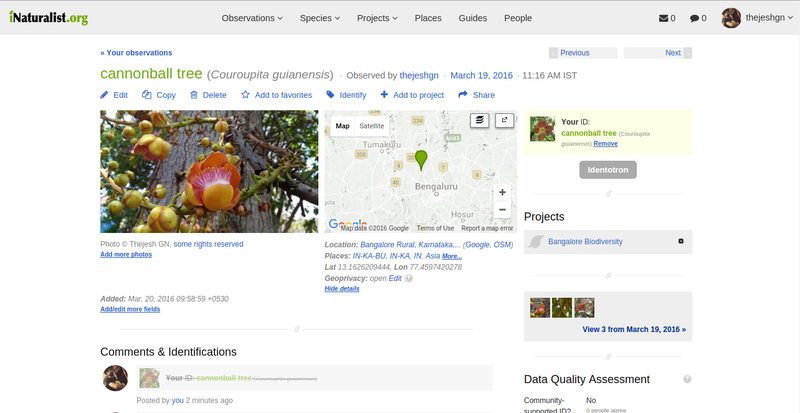 I am doing this so it becomes easy to get information on species in Bangalore. If you are doing research or visualizing something about Bangalore, this could be an important piece of information. You can download all the data as KML. Most of the data is available under creative commons. So just use the data accordingly. 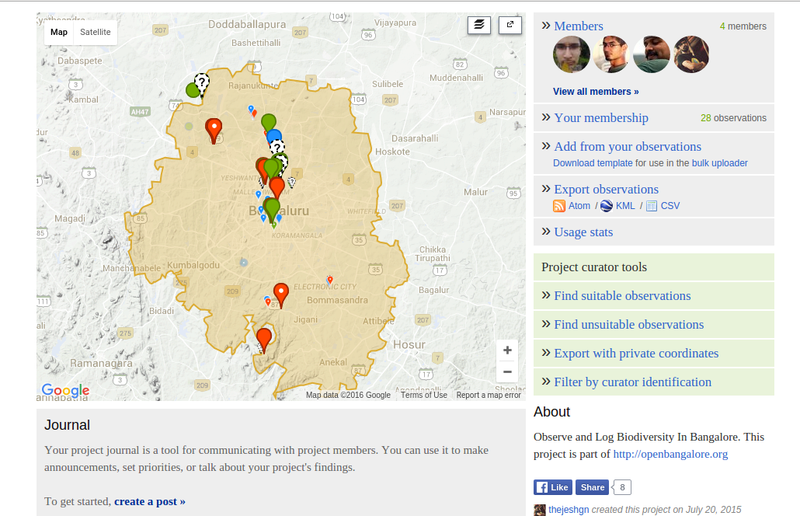 If you are student or nature lover I invite you to become a contributor. It would be a great addition to the community. If you become a contributor you should know that. The data you submit to iNaturalist will be available to the community under some form of creative commons license that you can choose. You can also submit sounds/audio along with pictures. 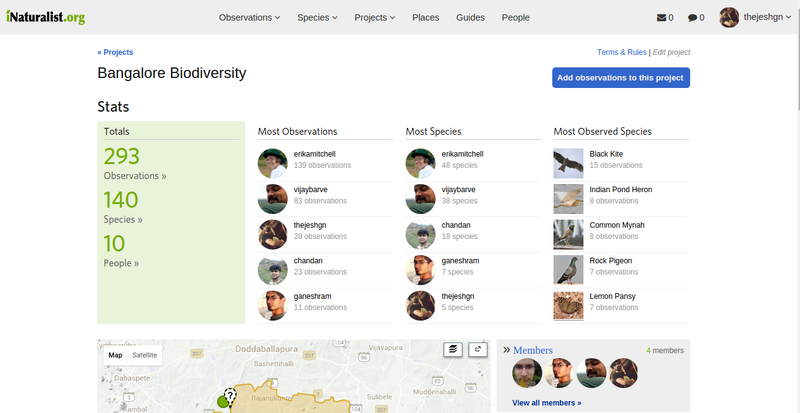 Also note that there is a data sharing relationship between inaturalist, India Biodiversity Portal and Global Biodiversity Information Facility. What are you waiting for? Go for a walk, takes some pictures of plants and animals and submit. It could be a great way to log your walk in a park or in western ghats. Nice post. I would like to add if you are an R-project for statistical computing (R) fan, you can use rinat package (https://cran.r-project.org/web/packages/rinat/index.html) to download data of a project and analyze it in R.
I have contributed the data from around the world. I just like to moderate the Bangalore ones.